We’d love to welcome you to Trent Bridge as Nottinghamshire host Somerset on Thursday 11, Friday 12, Saturday 13 and Sunday 14 April. The home side will be looking to build on strong performances with bat and ball in the Specsavers County Championship opener against Yorkshire, and will once again have Stuart Broad available for selection. You’ll be able to take in the action within a venue which has frequently been voted the best spectator experience in the country by cricket supporters, and one that holds a TripAdvisor Certificate of Excellence. Should you be thinking of attending, this matchday guide will tell you all you need to know. 96 overs are scheduled per day. Overs lost to bad weather can be made up in subsequent days, up to a maximum of eight per day. In the case of a longer day, times will be announced each day. If you can’t get here for the start of play, you can pop in after the tea interval to watch the final session at the reduced price of £5 for adults, seniors and under 21s; £1 for juniors (under 16s). 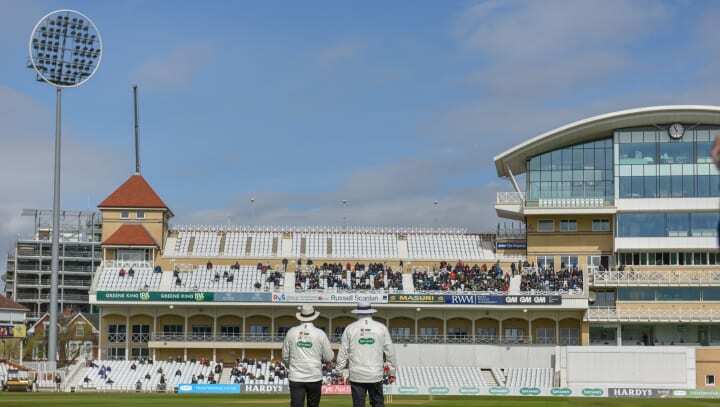 Becoming a member at Trent Bridge grants you a seat for all of Nottinghamshire’s home Specsavers County Championship fixtures, as well as all seven home T20 Vitality Blast group games and all four Royal London One-Day Cup matches. If you would like to purchase a membership, we recommend you do so in advance of the day of the game to beat the queues. You can do this online here or by calling the Ticket Office on 0115 899 0300 in advance of matchday. Alternative parking can be found in the Nottingham Forest Car Park, also priced at £3 or £2 for Members. Access for this can be gained off Lady Bay Bridge (NG2 3HF). Please note that parking will not be available at Nottingham Forest on Saturday 13th April. For souvenirs, replica shirts, bats, balls and training wear, our Club Shop is located at the rear of the Radcliffe Road stand, near to the reception entrance on the ground floor. Wheelchair viewing positions are available in front of the William Clarke and Smith Cooper Stands, as well as the Hound Road Upper, Radcliffe Road Lower and the top of the Smith Cooper Stand. If you still wish to bring your own food & drink, please ensure any food or soft drinks are in plastic or cardboard containers, avoiding alcohol, cans, glassware or metal cutlery. 2019 marks the 50th anniversary of Sunday League cricket, which for the first 18 years was sponsored by John Player & Sons. The heritage team at Trent Bridge would like to celebrate this milestone by remembering the various links between what was one of Nottingham’s biggest employers and the sport of cricket. During the lunch interval on Thursday there will be a short illustrated talk for Notts members in the Museum Room (off the Long Room, in the Pavilion) after which you’re very welcome to share your memories. All will be welcome on Friday lunchtime to a 'drop in' session in the reception area of the Radcliffe Road stand. On each day there will be a chance to win a ticket for Saturday or Sunday’s play by answering a few questions about the John Player Sunday League. If you would like to share your memories but are not available this week, please email heritage@nottsccc.co.uk.